The following will guide you through how to use Brand Management to allocate company headers. B)In preference use a logo associated with the account, if not found user one associated with the logged in user lastly use the companies logo. C)In preference use a logo associated with the account if not found use the companies logo. 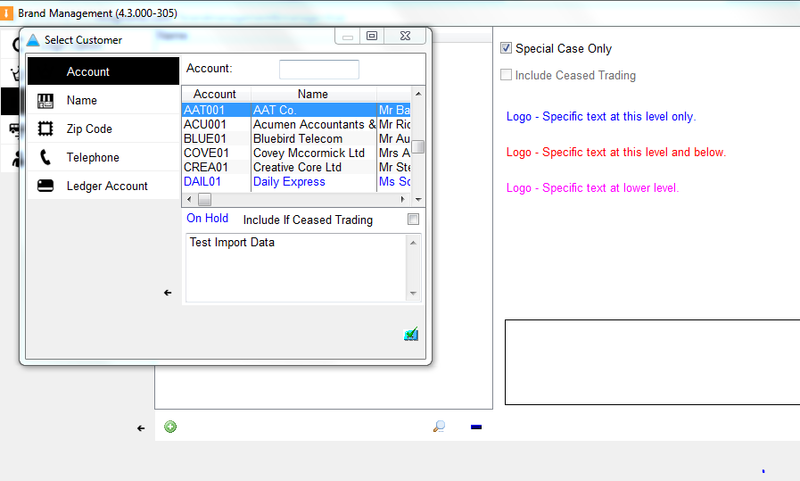 D)In preference use a logo associated with the logged in user otherwise use the companies logo. E)In preference use a logo associated with the logged in user if not found use one associated with the account, lastly use the companies logo. F) In preference use a logo associated with the operative associated with the document else use the companies logo. G)In preference use a logo associated with the account organisation type, if not found use the companies logo. 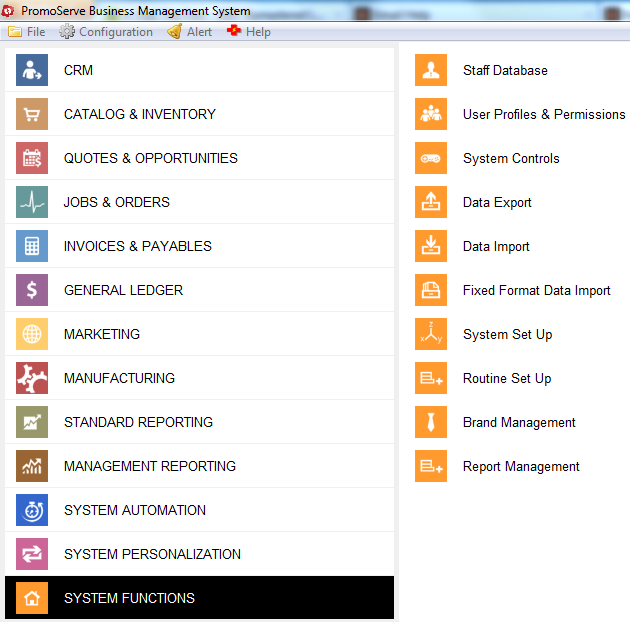 Select the one that best suits your needs then click the standard company tab at the top of the screen. 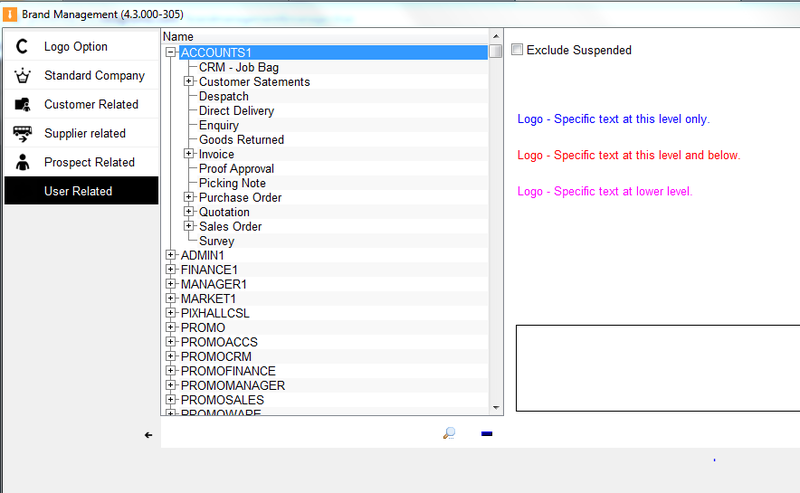 From this screen you can select the general document headers that are used in your PromoServe. This is an overview of that the customer, supplier, prospect, company document heard list will look like. From here you can select customers, suppliers, prospects, or users and allocate document headers for them. Select from either customer, supplier, or prospect. Click the green plus sign and choose which account you would like to associate logos with. The customer name will appear under the 'Name' column. If you highlight the name, you can click the magnifying glass to select logos. If you click the user related tab you will see a list of the users you have on PromoServe from this screen you can allocate specific document headers to be used when logged in to certain accounts. To allocate document headers first highlight the user you want then click the magnifying glass to brows for the image you want. When you have selected the images it will show the image as in the screenshot to the left.